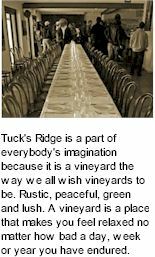 Tucks Ridge continue to produce the style of wines that other estates can only dream about. Chef TV superstar Iain Hewitson came to Tuck's Ridge once for a single episode of his cooking adventures and filmed seven. So what's not to love about Tuck's Ridge? An assemblage of six vineyards around the foothills of Dromana, Red Hill and Merricks North. All are north facing blocks, critical to fruit development. Grapes are gently destemmed, crushed and chilled before loading into the press where juices are delicately coaxed from skins. Following three days of cold settling, juices are racked and warmed, inoculated and transferred into exclusively French oak barrels for vinification in a cool, temperature controlled environment. A component is treated to maloactic and a regimen of regular stirring of lees. The team insist on the finest oak, a selection of Dargaud & Jaegle, Taransaud and Seguin Moreau, medium to light toast oak barrels. Tucks Ridge is matured several months before being assembled into the finished wine and clarified, finished and sterile filtered for bottling. Beautiful light straw hue. An appealing nose of melon and figs, stone fruits and blossom, veiled in citrus spice, complex and clean, focused nectarine along with tropical hints. The palate adds apple, cradled in a soft vanilla blanket, balanced and tight, generous texture with seamless transition from thr front of palate, flavours continue as a lovely creaminess balances beautifully on a crisp acid finish.